Heat grill. Gently press tofu cubes between layers of paper towels to remove excess moisture. Brush grill rack lightly with oil. Alternately thread tofu, mushrooms, onions, bell pepper and zucchini onto four 12 to 14-inch metal skewers. 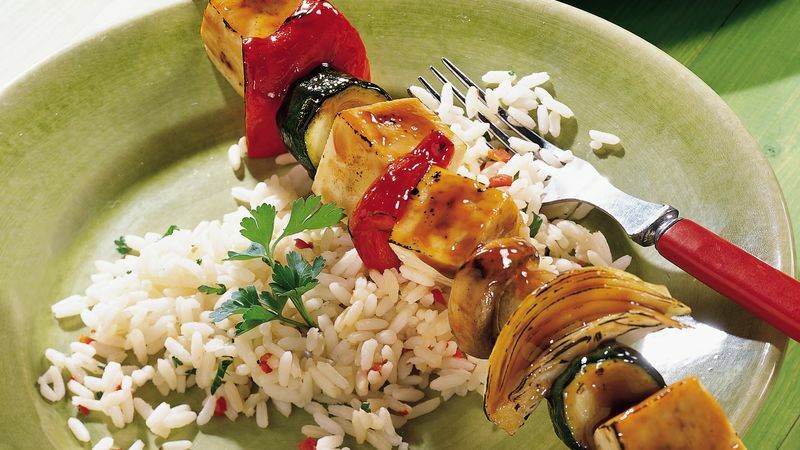 Spray kabobs on all sides with nonstick cooking spray. When ready to grill, place kabobs on gas grill over medium-high heat or on charcoal grill 4 to 6 inches from medium-high coals. Cook 6 to 8 minutes or until vegetables are crisp-tender, carefully turning occasionally. Brush with teriyaki baste and glaze; cook an additional 1 to 3 minutes or until glaze is set, turning to cook all sides. Watch carefully to prevent glaze from burning. Teriyaki sauce is available in thin or thick consistencies. For this recipe, use the thick, shiny teriyaki glaze. Silken tofu, which is sold in shelf-stable packages, has a custard-like texture. Firm tofu, stocked in a refrigerated case in the produce section of the grocery store, has a sponge-like texture. Firm tofu is packed in brine that is drained and discarded. For this recipe, use firm tofu packed in brine. Turn these kabobs gently to keep the tender tofu intact. Serve these kabobs with rice, sesame breadsticks and a lettuce, cucumber and mandarin orange salad tossed with sweet-sour vinaigrette. Lemon sorbet makes a light and refreshing finale.